The light cavalry trace its origins directly from Eastern Europe and the Eurasian steppes beyond. To counter the threats of the Ottoman Turks and the Tatars, the European powers adapted themselves to their style of warfare with the creation of certain types of cavalrymen (Hussars, lancers, jaegers, pancerny, Cossacks). This style of fighting evolved differently from the West which stressed the importance of heavier, more shock-oriented types of cavalry. When the Western powers came in contact with the Eastern and Central nations during the 30 Years War, they were quick to observe the importance of the light cavalry elements and so when many Croats, Poles & Hungarians were recruited as Hussars or lancers (either as mercenaries or enemy deserters pressed into service), they inevitably brought with them their tactics, traditions, equipment & edged weapons. Among these were 2 types of swords, one with straight & long blade and the other with a curved blade. The straight ones (Hegyestor in Hungary and Koncerz in Poland) were carried on the left side of the saddle and were very easily recognizable by their very long and narrow blades that was suitable only for thrusts, as it’s main role was as a replacement for the lance if it were to break or get lost. Another substitute was the Pallos who had a large broad blade that was often sharpened on both sides like a traditional cut and thrust sword. Usually horsemen carried only one of the 2 aforementioned types along with their sabers and that only in the Eastern European battlefields. Those that migrated westward left behind the Pallos and Hegyestor as they would no longer have the same tactical advantage as it did on the Eastern fronts. When the Hungarian cavalrymen were recruited into Western European service they thus mostly carried only their trusty szabla which was an important part of their culture, one that would play an important part of the European light cavalry tradition long after the disappearance of these cavalrymen. Before the 1700s there were no proper rules & regulations established for the production of edged weapons so there was no complete uniformity with the sabres carried in Europe. Mercenary Hussars brought their own sabres and sword smiths either copied or refurbished these at their own level but the State did not issue any specific standard model at the beginning of the 1700s. This started to change when in the 1750s the forerunners of the regulation armies, which were without doubt those of Prussia and France suggested patterns modelled after the Hungarian-Polish szabla. But the vagueness of these regulations most often lacking drawings and ''blueprints'' resulted in the commanding officers as well as manufacturers interpreting them in their own way, thus the existence of a variety of sword versions for a single pattern of sword. The first attempt at standardizing the sabre for hussars occurred in the 1750’s in order to reduce its cost but it took several years to incorporate these "suggestions". All of the regiments were owned by a proprietor or mestre de camp (generally referred to as the colonel of the regiment) and it is they that resisted modifications that tended to reduce the uniform distinctions of their regiments. One such example is when in 1752 the French army decided to impose a single new and official pattern for all light cavalrymen, including Hussars. The count of Bercheny (at the time he was the Lieutenant-General of the King's army and commander of the hussar regiment of the same name) was against such changes made against it’s ‘’beloved corps’’ and influenced greatly the decision issuing to Hussar regiments a sabre that followed faithfully the Hungaro-Polish stirrup hilt pattern. Decades later Hussars would continue to fight teeth and nails to preserve their sabres against new regulations throughout the 1700-1800s. Aside for the Austro-Hungarian Empire (the land of Hussars) the other nation where the most die-hard defenders of the Hussar were found was France, and as a result of its power and political influence, many of its models were to be be copied by other European nations, as we shall see below. On the other hand the German States hussars had a different mentality: edged weapons were not made exclusively for so and so type of cavalry but were made to be carried universally (models for dragoons, mounted Jaegers, hussars and horse artillery altogether). This is partially explained by the fact that the German soldiers were more docile (and pragmatic) than their French and Hungarian counterparts in the face of regulations so accepted edged weapons uniformity and were more ready to move on to accept radically new and improved designs. This is the typical hussar style sabre from the 1600-1700s used by Hungarian and Polish armies. Sometime around the last decades of the 1600s the Polish szabla type started to replace the Hungarian one. This Polish version had extra protection via a knuckle bow extension (either curved or straight). It is after these Polish models that stirrup hilt hussar sabres have been modelled. Some of these models had most often straight ''incomplete'' knuckle bows that did not connect with the pommel. The stirrup hilt is the average hussar hilt that is the most widely known and which saw considerable use in all major powers at the time. It follows the same lines as the Hungaro-Polish sabres as they are their logical evolution and adaptation to the Western European regulations. The blades were simplified with the overall broad fuller on each side and officer swords were etched with flowers, square-shaped forms often called ''grotesque'' and military items (bugles, drums, lances, helmets). It is worthy to note that that many collectors refer to these hilts as Hungarian (a la Hongroise) but the truth is they have a lot more in common with Polish hilts. The longevity of those models is due to the will of the hussars that wanted to preserve as much of their tradition as possible in the face of new regulations that were trying to it all take away for the purpose of uniformity. But after the years 1820s, being replaced by the new generations that will make part II, this type is relegated to a side arm for horse artillery units. In Poland, where the szabla has taken on a legendary reputation, this tradition will also be kept with even more steadfast loyalty with the stirrup models 1921 and 1934, the last swords still in service during WW2 to be carried at the front (not those charges against tanks; they never actually happened). Fun facts: you may notice that most of the sabres discussed here did not have any wire grip; hussars hated them because they were not true to the original sabres and the wire was already found in heavy and medium cavalry swords, something that hussars wanted to avoid in order to remain considerably exclusive to the rest of the cavalry, even against other light cavalrymen (mounted jaegers/Chasseurs thought themselves to be the equivalents of Hussars but these thought otherwise). As a result of this elitism most if not all regulation models from 1700s right up to 1816 were devoid of any of wire grip, only officers had it on theirs. The forerunner of this type was the Prussian 1721 hussar sabre that saw a considerable service until the Napoleonic wars. It started with a B form knuckle bow that progressively became a P from 1740-1750 during the Seven Years war. A Prussian hussar of the 4th regt von Puttkamer: often referred to as the “White Hussars” because of their white pelisses or die Bählämmer (the bleating lambs), later die Wölfe im Schafspelz (the wolves in sheep's clothing) or simply die Wölfe (the wolves). The Austrian model 1768 innovated the genre by connecting the rivets to the back strap for increased durability. The British model 1796 copied the design & lightly modified it by adding a ferrule and as a result cut the langets in half and then modified the knuckle bow shape to give it that particular P shape. The resulting form is the dove head hilt that we are most familiar with and this sword pattern would prove to be extremely popular in the German states and especially Prussia where it would spawn the contemporary 1811 sabre, the M1873 and a full series of dove head (and generation of lion/panther heads) officer swords that would be carried up until the end of the 3rd Reich. The C guard type was mostly found in the southern German and Italian states during the end of the 1700’ss and beginning of the 1800’s as trooper weapons. Some of them are found in France and England but only carried by high ranked officers. They are rather easy to spot for they are rather similar to the stirrup hilts but with a large square-angled flat pommel along with a shortened back-strap that gave them a shape very similar to the traditional Eastern sabre. An exclusive model found only in France, it is most commonly referred to as a l'Allemande (German) because it traces its origins to the town of Strasbourg were the maker Berger offered them at high cost. Because of the high prices these commended but also because of their shape reminiscent of the Hungaro-Polish models, these were used almost exclusively by senior light cavalry officers, eager to show their wealth and loyalty to the ancestral models. Although it made its first appearance somewhere in the year 1780 it’s increased popularity and subsequent extensive use will come during the closing years of the Revolution (the periods of the Directory and Consulate) and the early years of the Empire. The need for extra protection to the hand paved the way to a whole new generation of hilts that would replace the use of all the types listed above, the following 2 sub-types are the pioneers of such changes. A rather exclusive weapon for officers and wealthier NCOs, these distinct types were made with customized guards that had swivelled/collapsible branch(es) integrated for extra protection to the hand. This system was almost uniquely found in Austrian cavalry service; the model 1788 for medium cavalry was built along the same lines and it is not surprising to see it integrated to light cavalry models. French, Italian and Polish officers came in contact with this sub-type following the wars waged against Austria & modified other models/types with it. During the French Revolution it was often seen in a specific model for infantry officers; it was then adapted for a short time by light cavalry officers who were attracted by this the novelty. A rather important change signalling the end of an era is the introduction of those sabres with an integrated branch. Rather than having to modify or order a special commissioned sabre with movable guard, this type was often seen as a better and more practical weapon for campaign use because of its handsome yet discrete protective branch. 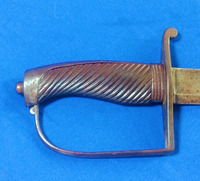 However this kind of sabre was rather rare due to being victim of its own success, as the bars/branches proved to be very effective on the battlefield to the point that the less than a decade after its appearance hilts with 2 or more branches were already being distributed to all light cavalry regiments, marking the rise of another generation of edged weapons. This one will be the focus of the second part. thanks for this writ up and the excellent collection of images. What a thoroughly excellent post. You've got karma coming downrange, priyatel' moj! This is a post that appeals tremendously to me, yes, just the other day I was rewatching for the umpteenth time "With Fire and Sword" so . . . Hussars up! Was asked for a write up on westernized sabres last fall and found myself mired in trying to understand the morphology for a lack of eastern european historical background. The most significant path to westernized sabres appears to be thru Hungary. The defeat of the Ottomans at Vienna in 1683 started a landslide in Austrian development as the new power in the Balkans. Hungarian mercenaries rapidly filtered to all the European courts looking for work. By 1745 they were established in most major power centers. The only connection not mentioned by you is the Uhlan. When the Golden Horde collapsed many Turco-Mongol lords caste there lot with the Kingdom of Lithuania and the Polish Lithuanian Commonwealth. The Husaria became heavy cavalry in Poland and the Uhlan tradition was the sustained light cavalry of Poland that was adopted as lancers all over Europe. The traditional light sabre survived in Europe as a token weapon of non cavalry units. From Napoleonic times the percieved need for a weapon more suitable to use of the point quickly gave up on the hard curve of the eastern sabre, for a lesser one affording better straight line thrust. A most excellent and truly well written post, with awesome illustrations to boot! I'm sure this is a time consuming endeavor (although clearly a labor of love) and we obviously appreciate it. I'm looking forward to part II eagerly. I'd always wondered how the Hussar stirrup and cup/bowl guards managed to be issued alongside each other, and your explanation of the insistence of the Hussars to maintain the traditional saber explains this. Oh, and another vote for sticky immortality for this post. And I've sent a richly deserved karma your way. Where do the partial chain link handguards come in? Never understood the use of those. Intermediate step in the development of the knuckle bow guard. First things first, thanks to each and everyone of you! I didn't expect this subject to be that popular so I am very (pleasantly) surprised and even more anxious to do part 2 even though, as SPQR said, it is time consuming but not in vain. I hesitated a lot with the influence of the Tatars (and later Bosniaks & uhlans) since a bit out of context for the time frame and thought it might be better for an article dedicated on the Eastern (Batorowka, scimitar, Karabela, tatar hilts) and Cossacks sabres of the 17th cent. By the way that's when and where the chain links (in answer to sir Thorfinn's question) have their origins upon contact with the Turkish kilij and Persian shamshirs that had some of those ''attachments''. Suggest that as your topic is propogation of Hussar sabres to Western Light Cavalry you have to take into consideration 18th Century military/geopolitical circumstances as they existed in the 18th Century. By the 17th Century Polish Uhlans were no longer foreign tartars. They were Poles who had passed the ethos of the Husaria on to this new generation of lance weilding light cavalrymen. And their weapons were already evolved to a level similar to the German modes of the period. It valid to point out that Poland and Austria were both spreading sabres westwards thru different channels. That's sound advice and valuable information! Only very slightly off topic, but I have ordered Zablocki's Szable swiata (Sabers of the World), and will doubtless be cudgeling my brains trying to decipher the Polish descriptions in the near future. At the very least, hey, pictures and measurements! 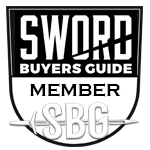 These swords are not in my collecting intrests but I learned a lot of reading this. Big thanks for taking the time to write this. Finally, it is (lightly) updated with 2 more types on the list. Lancers and Hussars are known as light cavalry whereas cuirassiers were known as heavy cavalry. What it means that Lancers and Hussars were lighter men and hence they used light cavalry sword but cuirassiers used big horses and they were the biggest men so therefore used heavy cavalry sword. Unless you were a Polish Hussar, then things get kinda turned inside out. You're not wrong in effect, but the history of national styles of warfare and how these atyle resolved themselves over time is a bit more complicating and thus interesting. Looking for some expert help here.I picked this up very recently. 1788 Pattern Cavalry Sword, 291/2inch single edged slightly curved blade. Large fuller with narrowback edge fuller. Steel D shaped knuckle bow and downswept quillon.Steel backstrap. Polised wooden angled ribbed grip. Some edge nicks. POB: 6.5'' (16.5cm) from crossguard. Profile taper: 1.27'' (32.4 cm) at ricasso, 1.15'' (29.2mm) at mid blade, 1.03'' (26.2mm) 2 inches from tip. Distal taper 0.29''(7.4.mm) at ricasso, 0.17'' (4.3mm)at mid blade, 0.12'' (3mm) 2 inches from tip. These stats make it a lot smaller and lighter than the regulation 36 inch blade and 2lb 14oz weight of a British 1788 according to Robson. Also there are no langets on the hilt. The angled ribbed grip with no langets is similar to a 1788 hilt shown in World Swords, 2006 edition by Harvey Withers, page 80. He describes this a variant, possibly Volunteer Regiment. The large fuller ends only 3 inches from the point which may indicate the sword has been cut down but it doesn't look like it has been altered. Any ideas anyone? The only suggestion that I could come up with is that this is a non-regulation infantry officer's sword. I know that flank company officers later liked to carry swords that looked like scaled down versions of the iconic 1796 light cavalry blade. Anybody seen similar before?I picked this up very recently. 1788 Pattern Cavalry Sword, 291/2inch single edged slightly curved blade. Large fuller with narrowback edge fuller. Steel D shaped knuckle bow and downswept quillon. Steel backstrap. Polished wooden angled ribbed grip. Some edge nicks. Profile taper: 1.27'' (32.4 cm) at ricasso, 1.15'' (29.2mm) at mid blade, 1.03'' (26.2mm) 2 inches fromtip. Distal taper 0.29''(7.4.mm) at ricasso, 0.17'' (4.3mm)at mid blade, 0.12'' (3mm) 2inches from tip. These stats make it a lot smaller and lighter than the regulation 36 inch blade and 2lb 14oz weight of a 1788 according to Robson. Also there are no langets on the hilt. The angled ribbed grip with no langets is similar to a 1788 hilt shown in World Swords, 2006 edition by Harvey Withers, page 80. He describes this a variant, possibly Volunteer Regiment. The large fuller ends only 3 inches from the point which may indicate the sword has been cut down but it doesn't look like it has been altered. Any ideas anyone? The only suggestion that I could come up with is that this is a non-regulation infantry officer's sword. I know that flank company officers later liked to carry swords that looked like scaled down versions of the iconic 1796 light cavalry blade. Anybody seen similar before? Is it not British at all? All suggestions welcome. The journey not the destination. It is a non-regulation infantry sabre, not a P1788 light cavalry sabre.